This quiz is based on the information presented in "Introduction to Infrared and Electro-Optical Systems," by Ronald G. Driggers and Melvin H. Friedman. 1. 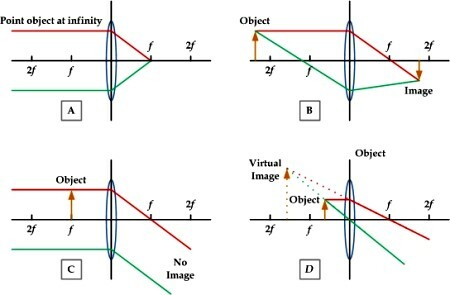 What is the term for light distribution on the image plane from a point source? 2. What is the term for when there is a fixed phase relationship of an EM field between two points in space or two points in time? 3. What is the term describing "any deviation of light rays from rectilinear paths which cannot be interpreted as reflection or refraction?" 4. Which material listed below has the highest total emissivity (defined as total spectral signature wrt a blackbody)? 5. Match the lens ray tracing diagram with its application type. 6. What is a 'Cold Shield' as used in electro-optical systems? 7. What are the two general classes of electro-photonic detectors? 8. What is a bolometer? d) A device which varies its electrical resistance depending on the total electromagnetic power incident upon it. 9. What is the modern name of the U.S. Army's former Night Vision Laboratory (NVL)? 10. What is Persistent Surveillance?